Miss Lata from Delhi does not have to look far for her regular purchase of cosmetics. She is able to go to a mall with her hopes and aspirations and shop to her heart's content with a full choice of cosmetic brands. But, does she get a full customised brand experience or is she just shown a set of standardised products and left to fend for herself? Does she leave the store with half a feeling of incomplete information, elusive education or doubtful decisions? This to my mind is a MALL CALL. Are malls only focussing on the structure and the infrastructure or are they really understanding the call of the customers who visit their mall?. Mrs Subramaniam, a well educated working mother of two intelligent kids, visits the mall to buy her children's clothing at Chennai .She too has a wide range to choose from .But is she truly satisfied with the service as well as the assessment of her particular needs? Does someone listen to her about her kids special preferences and suggest the relevant product along with knowledgeable advice. This too is a MALL CALL. Earlier it was difficult to get a choice of products under one roof. Now malls provide that. But the standards of Indian consumers have gone up and they have become world-class consumers. They do not just want products, they want advice, they want guidance, they want a clear solution to their needs. Mr Shah buys his shirts and trousers from the malls at Mumbai. He finds it convenient and easy to shop. But he has a craving which is yet unfulfilled . He feels that there is no one who understands his tastes, his likes and dislikes of colours and designs. This is a MALL CALL. Consumers want to be understood and served , making them feel special. Whether it is a Globus or Lifestyle or Shoppers Stop or Ebony or Westside or Pantaloon at any of the stores at the malls, each one has what I name a MALL CALL. A call from customers who visit the mall. Whether the Mall is Inorbit or Phoenix or Infinity. Every customer is making a MALL CALL. But are the stores and malls listening? A time has come to go beyond just the handing over of goods displayed to making sure that the customer who visits the mall is fully understood and does not leave with a feeling that he wanted more but did not get it. The customer is looking for sensitivity and appreciation of his or her needs and special wants. Therefore he or she visits malls and not the corner store. If the normal store is able to give personal attention and serve individual needs customers would go there. This is a wake up MALL CALL to all the new stores and malls in India. Customers started visiting stores at malls because they got a wide range under one roof with a good ambience and received it conveniently. But that stage is over now. Everyone is expecting and getting these things in a location, which is near their home. But now what? Customers expect more so that feel that connect with the store or mall brand. Today there are about twenty to thirty malls with hundreds of anchor stores. In two years there will be over three hundred malls and thousands of anchor stores. What will be the difference between one and the other? That is the MALL CALL. It is a call to all stores and malls to be sensitive and personalised to ensure the grand brand experience .It is not sufficient to provide tangible facilities or even a loyalty program. It is more than that. Customers are changing day in and day out. Their expectations are rising, They are looking for their intangible needs being satisfied. A smile is necessary but not sufficient, because every competitor will smile. Walking the extra mile mile be needed along with the smile to really make the customer happy, in terms of patiently understanding the customers desires. This the normal store does well. It is time to learn from them, though they may not have the space or range. This is the MALL CALL which stores and malls will have to pay heed to. This will truly bring about a tangible and intangible grand brand experience. Firstly there needs to constant interaction with customers to understand their changing needs and satisfaction levels. Secondly brands, products and services need to be placed or replaced or displaced as per customers needs. Thirdly regular training needs to be imparted to the sales and service staff to be sensitive to customers. Fourthly it is important to be vigilant about competition and see better ways of serving customers. Fifthly the stores or malls should not hesitate to make overhauls or drastic changes if necessary. It may be a revolutionary approach rather than an evolutionary approach. Sixthly and finally it is important to constantly look out and look in , to check changes in consumer behaviour in ourselves and use these as indicators. Listen to the MALL CALL and increase sales, customer satisfaction and profits. 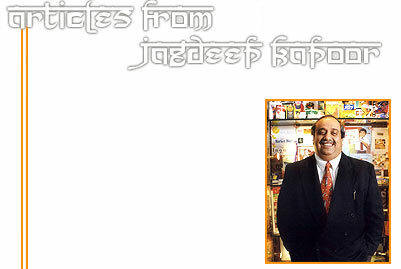 Copyright � 2007 All rights reserved with Jagdeep Kapoor, Managing Director, Samsika Marketing Consultants Pvt. Ltd.